Mobile plug-and-produce solutions are the need of the hour in today’s hectic production processes. Universal Robotics reveals the perks of these solutions which are highly flexible and easy to integrate. 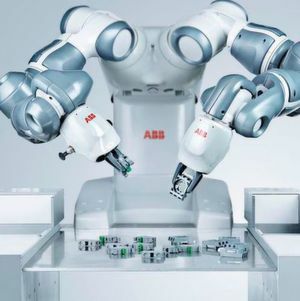 Popular across the manufacturing industry, Universal Robots is known for its small, flexible and efficient industrial cobots. 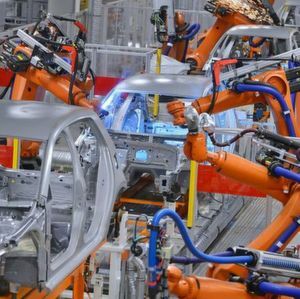 The Danish manufacturer boasts of its robots being used in more than 23,500 production environments per day. Some of the company’s leading clients include Bajaj Auto, Continental, Nissan Motor Company and many more. 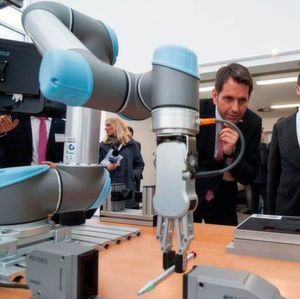 Recently, the firm also recorded a landmark feat – 25,000 sold cobots. This is a huge achievement and also paves numerous business opportunities for Universal Robots. The company’s UR cobot series is known for being cost-effective, light weight, highly flexible and extremely efficient. Segregated into three types – UR3, UR5 and UR10, each of these robots offer diverse advantages. The table-top UR3 cobot weighs only 11 kg and offers a payload of 3 kg. The light weight robot is quick, precise and enables players to increase their production with utmost precision each time. The UR5 weighs 18.4 kg, has a payload of 5 kg and can be used to optimize low-weight collaborative processes, such as picking, placing, and testing. With a payload of 10 kg and weight of 28.9 kg, the UR10 is designed for bigger tasks where precision and reliability are considered important. The cobot is most suited for carrying out heavy–weight collaborative processes such as packaging, palletizing, assembly, and pick and place. This year, Universal Robots is going one step ahead and is trying to make people aware of the diverse benefits of mobile ‘Plug and Produce’ via the assistance of the UR+ platform. The ‘Plug and Produce’ concept makes use of grippers, sensors as well as software. For instance, three UR3 cobots will be collaborating with each other to screw flashlights, insert a battery, and then make use of a laser to label the lamps. By witnessing this automation process, it will make people wonder how easily they can automate even complex processes with the assistance of the right UR+ supported plug in components such as grippers from Schunk and Dahl, laser from Telesys, and a force-torque sensor from OptoForce. Similarly, to extend its point further, the perceptual capacity of its robots can be demonstrated by making use of the UR5 along with an ATI force-torque sensor. Through this, it can be seen that the robotic arm follows the stipulated contour even when there is an uneven structure; this is a vital aspect for bonding processes or deburring. The latest addition to the firm’s UR+ range is the Plug-and-Produce camera from Sensopart and an electric gripper from Dahl that is designed especially for collaborative applications. The unique mobile plug and produce solutions are highly flexible and easy to integrate. Lastly, the UR+ enabled software from Octopuz enables users to use the software in offline mode to programme their own applications and the results can then be shared to a UR robot for a live demonstration. Suited for small and medium sized companies too, the range of UR+ solutions can reduce installation time and costs for automation solutions. The processes on the shop floor are changing, join in the automation revolution and witness the change!